It all began at Denman in 1993, when Gordon and I were tutors for the first-ever ‘Safe Cycling and Bicycle Maintenance’ course. It was thanks to the students that the Derailleurs was formed, that we began to have reunions twice a year based on the ten homes of people living in widely scattered parts of England and Wales. 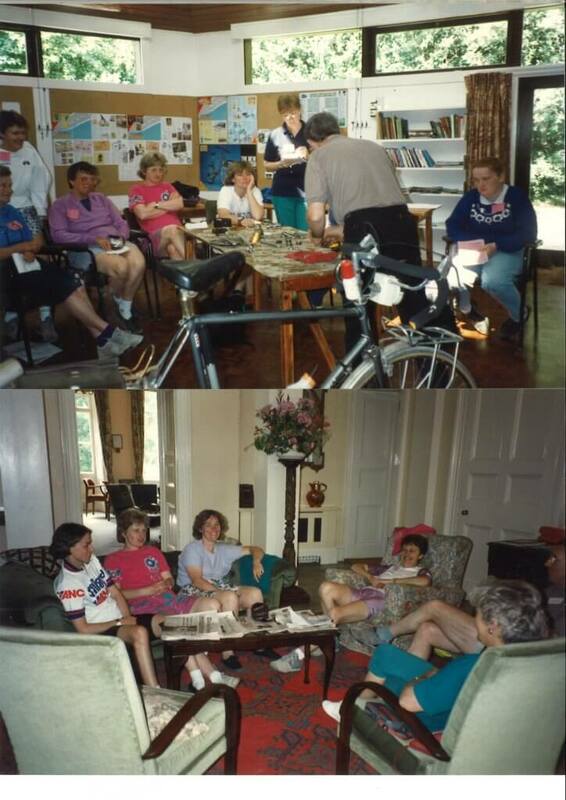 Hosted by WI members, we met and cycled in North, South, East and West, where children, husbands and friends joined us for day rides and evening meals. Wearing our new green ‘strip’, we were easily spotted by whoever was leading the line or bringing up the rear. That was usually Gordon, who regularly adapted his speed to the slowest of us. ‘No matter what you taught us, we need you to come to the rescue if we break down,’ they said. He was sometimes the envy of other men as he sat drinking with several ladies younger than he was. Advice about safe riding in a group was abandoned on our way up the edge of the Chilterns towards Berkhamsted, when two speedy lycra-clad men shot past us at the moment when the hill had become too steep for most. Then a streak of green flashed by, as Diane got into racing mode. Cheers for the DD’s champion as she overtook the men, leaving them wobbling in surprise. Evenings at Denman were spent in map-reading, route-planning, discussion about waterproof gear and answering questions on technical matters. Then came our last session together, followed by entertainment the like of which fellow students of the Bridge, Craft and Cookery schools had never before seen. Creative cyclists presented a Fashion Parade never-to-be-forgotten, making use of shorts, capes, sun hats, fleeces, tools, black plastic bags and road safety cones. 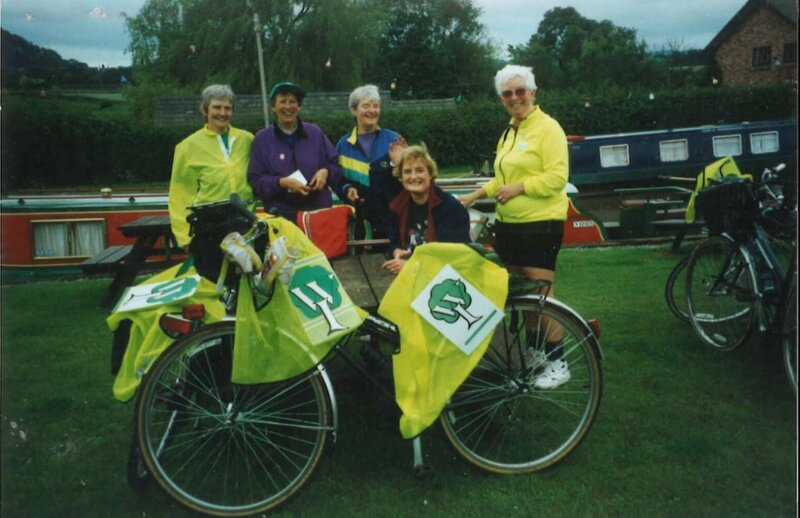 Denman brought us together and we have just celebrated out Silver Anniversary, gathering in Tewkesbury, seven of us with a lot of two-wheeled memories. We managed only a short ride because of wet and windy weather, but there is plenty to see in this historic town and we had much to discuss over tea, cake, wine and food. We toasted Gordon, who died in 2012 and GIll, who could not be with us this time. 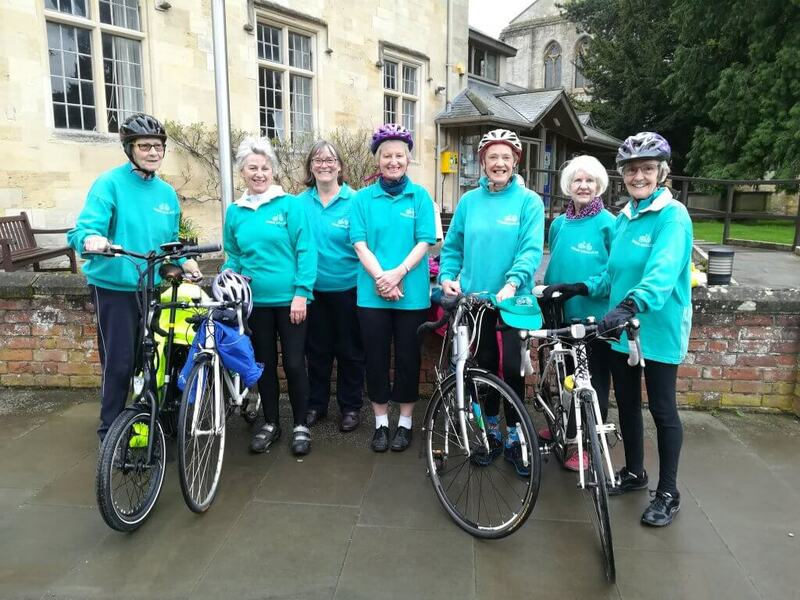 Mary, our oldest member, who in 1993 arrived at Denman having cycled from her home near the river Severn, is now in residential care, but we all drove to Oldbury to take her out to lunch on Sunday, after first making ourselves known in Tewkesbury Abbey. Here’s to the next 25 years, Denman and the Derailleurs! With thanks to the Derailleurs for the stories, photos, memorabilia and above all, support of Denman for the last 25 years.